Most tourists choose to join a tour that starts and ends in Hanoi. Tours around Halong Bay with timber ship or junk is a favorite tourist types in Ho Chi Minh country. try typing the word Halong Bay Cruise on internet search engines. You will find various internet sites that offer various types of this tour. There are set prices so cheap to hundreds of dollars per person per night. There are offers luxury lodging in Cat Ba, stay one night, up to three nights. There also is providing an opportunity for participants to perform activities of kayaking past the cave and so on. All the people who’ve done the research to choose a tour of Halong Bay will get the same conclusion that is confusing. There are about 500 timber ships operating in Halong Bay. And mean competition between ship operators are also very loud. Thus the same is a lot of fraud, cheating makes tourists become victims. This article will try to help you to plan a trip to Halong Bay, using either organized tour or independently. Before giving some examples of the types of Halong Bay tour boats to choose from, here are some of Halong Bay Cruise tours to choose from. 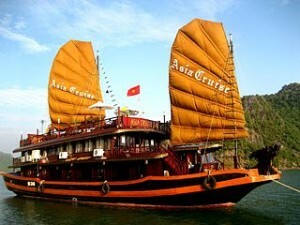 Halong Bay Cruise is divided into several types of which are very cheap tours and day tours with tour prices around $ 30. Cheap Halong Bay Cruise ranging from USD60 per night including using boats Christina Deluxe, Lagoon Explorer Junks, and Emeraude Cruises. Halong Bay Cruise with Standard rates start from USD90 per night, the ship belonging to this group include Heritage Cruise, a new ship with 10 cabins and all have a bathroom inside. Ships equipped with large upper deck, dining room and bar. Paloma Cruise, the Chinese timber ship which consists of 4 decks, a restaurant, a bar with a plasma television, a spa, and an open dining room. Imperial Cruise, a wooden ship with the original style of Vietnam. The length of the vessel is approximately 32 meters and consists of 10 cabins. Violet Cruise, has an elegant dining room, a gym, and a spa. Poseidon Sail, one of the new timber ships with contemporary Vietnamese style with 8 cabins. Ginger Cruise, the ship first set sail in 2006 and have 3 deck which consists of a lounge, a restaurant, two bars, a library, and 10 cabins. And some of Halong Bay Cruise ships like the Standard Classic Sail Cruise, Minh Hai Junk, and Victory Star Elizabeth Sails. Deluxe class Halong Bay Cruise is recommended as Galaxy Cruise, the ship was launched in 2011 and is a Vietnam-style wooden ship, this ship has 9 cabins. Golden Lotus Cruise, the ship has three floors. 20 cabin which includes a cabin for the family. each cabin has an area of ​​19 square meters with a bathroom, air conditioning, and other facilities. A-Class Cruise has 11 cabins, a bar on the upper deck, and restaurant, Bhaya Cruise, has four ships, with a total of 80 cabins, Halong Emotion Cruise, the ship was launched in 2008 which consists of 28 cabins with private bathroom. As well as others such as deluxe ship Calypso Cruise Halong, Glory Cruise, Princess Junk, and Red Dragon Junks. As for Halong Bay Cruise luxury class among which is the Paradise Cruise, Syrena Cruise, Au Co Cruise, Phoenix Cruiser, Indochina Sails, the Hanoi Opera Cruises, Emeraude Cruise, Nina Criuser and Columbus Cruises. Here are some recommended travel agents among which Handspan located at 78 Ma May Hanoi, Vega Travel is located at 24A Hang Bac Street Hanoi, South Pacific Travel JSC located in Ly Nam De Street 32M Hoan Kiem Hanoi, and AST Travel Jsc located at 56 Cau Go Street Hanoi.